Possessing 20% of the world’s proven petroleum reserves, Saudi Arabia has long played the expected role of benefactor among its fellow Arab and Muslim countries. With a total aid budget of $3.1 billion in 2009, Saudi Arabia keeps one of the largest humanitarian aid funds in the world. Much of that aid went to hardship-struck Muslim nations, including Pakistan, Somalia and the Palestinians. But since the Arab Spring took root this year, Saudi Arabia has spread its largesse among its own citizens and Gulf Cooperation Council (GCC) neighbors — a large part of $150 billion worth of social welfare spending in the region since the unrest began, according to a new report by Merrill Lynch Bank of America. Only days following the collapse of former Egyptian president Hosni Mubarak’s regime in February, for instance, Saudi Arabia announced a social welfare package for its citizens worth $10.7 billion, featuring pay raises for government employees, new jobs and loan forgiveness schemes. By the end of the month, the handouts totaled $37 billion. In March, the trend continued, as Saudi Arabia’s King Abdullah heralded an additional $93 billion in social spending. Such generosity was no coincidence, noted the Merrill Lynch Bank of America report’s authors. “The initial response of GCC policymakers [to the Arab revolt] has been to sharply increase current spending to accommodate social pressures and to pledge intra-regional fiscal transfers to less endowed members,” wrote Jean-Michel Saliba, Middle East and North Africa economist for the firm. In addition to Saudi Arabia, the United Arab Emirates (UAE) capital of Abu Dhabi put forward plans to spend nearly $2 billion to provide housing loans to Emiratis, while Qatar announced this month an $8 billion payout in wage, salary and benefits increases for all state and military personnel. 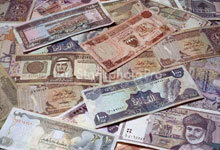 Oman and Bahrain have also indicated they would increase social spending by the billions this year. Aside from raises for state employees, the spending in these Gulf states will go toward infrastructure and social amenities, such as roads, schools and hospitals, and further subsidies on food, water and power consumption for citizens. Saudi Arabia’s generosity has been criticized as a means for the Arab world’s most populous country to make political gains and spread influence. The Merrill Lynch report also does not take into account the cost incurred by Saudi Arabia to send its troops into neighboring Bahrain to help quell a Shiite uprising there — another action to prevent revolt from reaching its own borders. But in a recent analysis of the Arab Spring for Arabic Knowledge@Wharton, Wharton legal studies and business ethics professor Stuart Diamond said the spending by the Saudis demonstrated their understanding of negotiation. “They understood that for many people, it was about Maslow’s [hierarchy of] needs triangle: that is, basic life necessities such as food, shelter and health mattered most. So the stipends that the Saudi government gave helped to quell disturbances,” he noted.